LARAMIE – The Friday afternoon meeting started plainly. 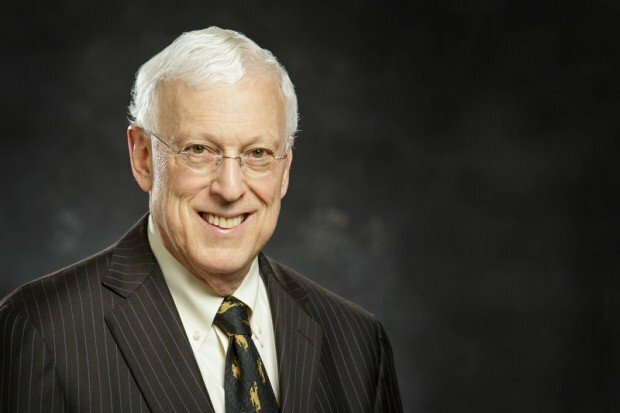 University of Wyoming President Bob Sternberg explained recent resignations of university administrators to about 100 law students, faculty and alumni. Sternberg took the helm of UW on July 1. Since then, the provost, three associate provosts and four deans have resigned. Sternberg explained to students that some were asked to resign. But then one of those administrators stood up and protested. “I’m prepared to lay out my case as to why you have not treated this law school ethically," said Stephen Easton to Sternberg. Easton resigned last week as dean of the College of Law because he said no one sought his input on task force being assembled to look at the law. Words got heated as Easton and Sternberg disagreed about how the meeting should be organized. “I feel like he’s hijacked the meeting,” Sternberg said of Easton. Some of Easton’s statements received applause from the audience, and at one point, Richard McGinity, the interim vice president for academic affairs, stepped in to save the president. While Sternberg had wanted a town hall-style meeting to explain the whirlwind changes at UW, including the task force, Easton told the crowd he wanted a trial-like format in which he and Sternberg would make statements and rebuttals. Easton said that at the conclusion of the trial-like meeting, students could make individual decisions about who they think is right. Easton, Sternberg and audience members debated for about 10 minutes over which format should be used. Sternberg’s town hall proposal ultimately won out, with a promise that he would return for a trial-like format. Shortly after moving to Wyoming, Sternberg began traveling around the state and meeting with people. He began to hear critiques of the law school. 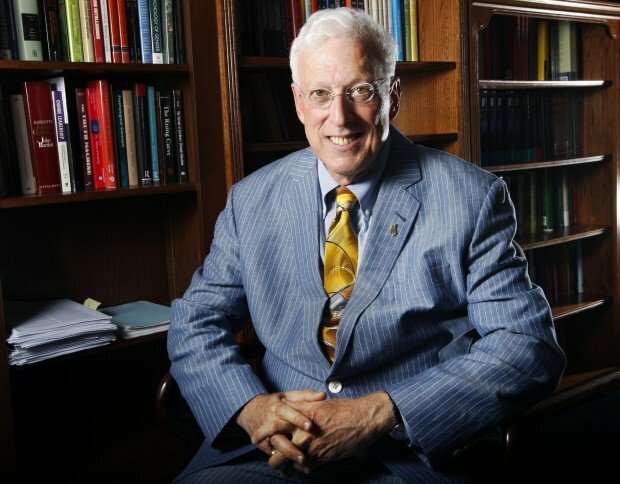 “I know you want me to be straight and I’ll be straight,” he said, explaining that people told him that UW’s law school used to be top in the country in energy, natural resources, water and environmental law. The task force will look at that, he said. Students bristled over the task force, worried that the end result could be an emphasis on energy and environmental law at the expense of other types of law. “We can’t spend the amount of money that we spend on a legal education to graduate and can’t — because of any changes that were made — become a prosecutor or become a defense attorney or focus in family law because our education was too focused on supporting the energy industry," said second-year student Baend Buus. Sternberg told students that the task force will not mandate changes but suggest them. It will be up to the dean to implement them. UW history professor Phil Roberts said the task force may be meeting too early. The law school is in the middle of an accreditation review with the American Bar Association. “I find it curious there’s a task force being put together before the accreditation report comes in with the possible areas where we can do better and the possible areas where we’re doing OK,” he said, to applause. Students stayed in the meeting for about 15 minutes after Sternberg and McGinity left. Sternberg and McGinity said they had other previously scheduled appointments. Students asked Easton to explain what he wanted to say to the president. Easton remained silent, saying it was best to make accusations when Sternberg was present. Easton encouraged students to contact Sternberg’s scheduler to arrange for the trial-like format. By the end of business Friday, Jacquelyn Bridgeman, the interim dean of the law school, said she contacted Sternberg’s scheduler and they’re working on a time next week, possibly Tuesday. During the meeting students had noted that many UW trustees work in energy, and the task force chairman is a Cheyenne attorney who practices energy and natural resources law. That attorney is Larry Wolfe, who said he’s passionate about legal education. He said while his practice involves energy cases, it is diverse. He said students shouldn’t be worried that a study of energy law would hurt other areas of the law school. A good energy attorney needs a strong general legal education. After the meeting, Sternberg told the Star-Tribune that task force members will include the law school dean, associate dean, faculty, students, attorneys from different specializations and state legislators who are attorneys. The task force won’t necessarily be focused on energy. “If they want to look at other things, they’ll look at other things,” he said. But after the meeting ended, some students and alumni said they are skeptical of the UW president and his intentions for the law school. “I think there’s chaos in the university,” said Ray Hunkins of Cheyenne, who graduated from the law college in the 1960s. “There’s chaos in the college." Reach state reporter Laura Hancock at 307-266-0581 or at laura.hancock@trib.com. Follow her on Twitter: @laurahancock. The tide of administrator turnover at University of Wyoming begs the question: Is it too much, too fast? See Sunday's Star-Tribune.